Siriki Dembele in action for Posh against Plymouth. Photo: Joe Dent/theposh.com. 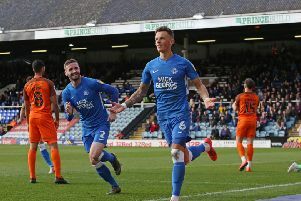 Peterborough United were agonisingly close to claiming a precious League One point despite playing with 10 men for over 45 minutes today (February 2). Posh substitute Louis Reed on the ball against Plymouth. Photo: David Lowndes. On-loan centre-back Ben White was the Peterborough Telegraph’s man-of-the-match. Transfer deadline day signing Josh Knight, a central defender on loan from Leicester, was an unused substitute. Kyle Dempsey: (for Cooke, 78 mins).